Intrigued, I added it to several of the sites that I manage that display Knowledge Graph cards in the SERPs. About a week later, I saw the following appear for the KG card for my dance team’s website. You can see in the bottom left the new social link to our team’s LinkedIn page. But it doesn’t show any links to any of the other profiles I linked to. It turns out that if you read the fine print in the documentation, Google will only display social links for *VERIFIED* profiles on social networks that have verification features. That means on sites such as Facebook and Twitter, your social links won’t show in the SERPs unless you have a magic blue checkmark. Also, since the markup needs to be on your official site, in its current form it will only work for Pages and not personal Profiles. 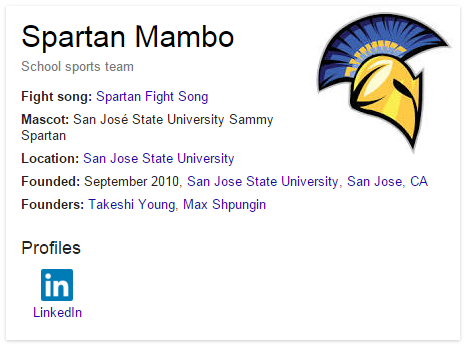 So that’s my experience so far with adding social links to Knowledge Graph cards. The other two sites that I added the markup to aren’t showing any social links yet, so I may need to revisit the code or it may be the case that I just need the social profiles verified. Pinterest – Does not appear in Knowledge Graph? Tumblr – Does not appear in Knowledge Graph? Hi, I want to clarify things about the social links on the knowledge graph. So you are saying that you should have a separate page for each social media account. What if you are doing a knowledge graph for a person? if you have a google account, you also have a plus page account isn’t. You mean you need to create another one? in my experience, social profile will be show up just for verified account. Is Google Plus still worth the time?